This book is an introduction to manifolds at the beginning graduate level, and accessible to any student who has completed a solid undergraduate degree in mathematics. 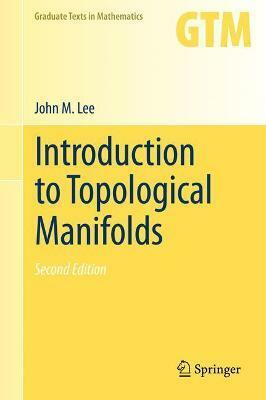 It contains the essential topological ideas that are needed for the further study of manifolds, particularly in the context of differential geometry, algebraic topology, and related fields. Illustrations note XVII, 433 p.
This text is designed to be used for an introductory graduate course on the geometry and topology of manifolds. It should be accessible to any student who has completed a solid undergraduate degree in mathematics. The author's book Introduction to Smooth Manifolds is meant to act as a sequel to this book. Preface.- 1 Introduction.- 2 Topological Spaces.- 3 New Spaces from Old.- 4 Connectedness and Compactness.- 5 Cell Complexes.- 6 Compact Surfaces.- 7 Homotopy and the Fundamental Group.- 8 The Circle.- 9 Some Group Theory.- 10 The Seifert-Van Kampen Theorem.- 11 Covering Maps.- 12 Group Actions and Covering Maps.- 13 Homology.- Appendix A: Review of Set Theory.- Appendix B: Review of Metric Spaces.- Appendix C: Review of Group Theory.- References.- Notation Index.- Subject Index. John M. Lee is a professor of mathematics at the University of Washington. His previous Springer textbooks in the Graduate Texts in Mathematics series include the first edition of Introduction to Topological Manifolds, Introduction to Smooth Manifolds, and Riemannian Manifolds: An Introduction.